Take a break from Colombo with a short trip to Negombo Beach in Negombo, about 52 minutes away. Spend the 9th (Sat) wandering through the wild on a nature and wildlife tour. The adventure continues: contemplate in the serene atmosphere at Gangaramaya (Vihara) Buddhist Temple, admire the landmark architecture of Colombo Municipal Council, tour the pleasant surroundings at Viharamahadevi Park, and make a trip to Kelaniya Raja Maha Vihara. For where to stay, maps, more things to do, and more tourist information, you can read our Colombo trip planner. Hamburg, Germany to Colombo is an approximately 18.5-hour flight. Due to the time zone difference, you'll lose 4 hours traveling from Hamburg to Colombo. In February, Colombo is warmer than Hamburg - with highs of 37°C and lows of 27°C. Wrap up your sightseeing on the 11th (Mon) early enough to drive to Galle. The southernmost city on the island, Galle combines colonial-era history with a tropical feel and climate. Venture out of the city with trips to Hikkaduwa Beach (in Hikkaduwa), Mirissa (Mirissa Beach & Dolphin & Whale Watching) and Bentota Beach (in Bentota). There's much more to do: steep yourself in history at Galle Fort, view the masterpieces at Pilgrims Lounge Chrishtopher Handicraft and Paint Gallery, pause for some serene contemplation at Dutch Reformed Church, and don't miss a visit to Japanese Peace Pagoda. For more things to do, where to stay, other places to visit, and more tourist information, refer to the Galle trip builder website . Drive from Colombo to Galle in 2 hours. Alternatively, you can take a train; or take a bus. Expect a daytime high around 37°C in February, and nighttime lows around 27°C. Finish up your sightseeing early on the 14th (Thu) so you can go by car to Ella. The relaxing hilltop village of Ella benefits from a more temperate climate than much of the rest of country thanks to its high elevation. Start off your visit on the 15th (Fri): don't miss a visit to Kinellan Tea Factory, then take in the dramatic natural features at Ella Rock, and then admire the sheer force of Ravana Ella Falls. Get ready for a full day of sightseeing on the next day: admire the natural beauty at Ella Spice Garden, get a new perspective on nature at R. M. S Antique And Brassware, then snap pictures at Demodara Nine Arch Bridge, and finally take your sightseeing to a higher altitude at Little Adam's Peak. To find more things to do, photos, other places to visit, and more tourist information, you can read our Ella tour app . Traveling by car from Galle to Ella takes 3.5 hours. Alternatively, you can take a bus. Finish up your sightseeing early on the 16th (Sat) so you can go by car to Uda Walawe National Park. One of the primary nature reserves in the country, Uda Walawe National Park provides vital habitat for a herd of Sri Lankan elephants. Start off your visit on the 17th (Sun): explore the striking landscape of Udawalawe National Park. For ratings, photos, traveler tips, and tourist information, read Uda Walawe National Park trip itinerary app . Traveling by car from Ella to Uda Walawe National Park takes 2 hours. In February, daily temperatures in Uda Walawe National Park can reach 37°C, while at night they dip to 26°C. Finish up your sightseeing early on the 17th (Sun) so you can travel to Sigiriya. The historic rock of the same name dominates the landscape of World Heritage-listed Sigiriya, where the steep and striking lava plug contains the ruins of an ancient empire. Kick off your visit on the 18th (Mon): don't miss a visit to Sigiriya World Heritage Site, then shop like a local with Sigiriya Craft Village, and then contemplate in the serene atmosphere at Golden Temple of Dambulla. To find maps, reviews, other places to visit, and tourist information, refer to the Sigiriya road trip tool . Getting from Uda Walawe National Park to Sigiriya by combination of taxi and flight takes about 2.5 hours. Other options: do a combination of taxi and flight; or drive. 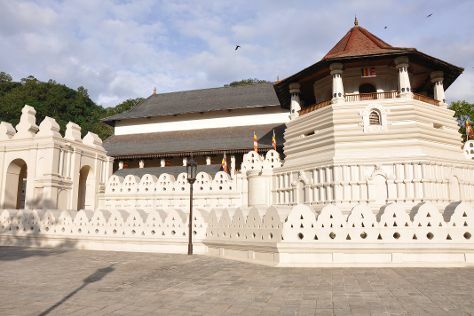 Finish your sightseeing early on the 18th (Mon) to allow enough time to drive to Kandy. Kick off your visit on the 19th (Tue): explore the activities along Kandy Lake, see the interesting displays at Raja Museum, then steep yourself in history at Temple of the Sacred Tooth Relic, and finally look for all kinds of wild species at Pinnawala Elephant Orphanage. On your second day here, identify plant and animal life at Udawattekele Sanctuary, make a trip to Kandy view point, and then admire the natural beauty at Royal Botanical Gardens. To see more things to do, maps, where to stay, and other tourist information, you can read our Kandy road trip planning site . Traveling by car from Sigiriya to Kandy takes 2 hours. Wrap up your sightseeing by early afternoon on the 21st (Thu) to allow time for travel back home.